bread crumb recipes. Indian bread crumb recipe collection. Bread crumbs literally mean the crumbs of breads. They are made by crushing or grinding toasted or leftover bread (which is not very soft). Making bread crumbs and storing them is a great way to avoid wastage of extra bread. The color and size of the crumbs will differ depending on whether the bread is dried, fresh or toasted. Ideally breadcrumbs are used to give a nice crunchy coating to food before deep frying it but it can also be added to gravies as a thickener. Bread crumbs are usually used for coating of the tikki or patty that is then either pan fried or deep fried. Using bread crumbs here gives a crispy outside coating to the food with a soft inside. Cheesy Noodle Cutlets are these chewy, delicious cutlets that kids will love! Have them with ketchup or with a sweet chilli sauce, they are sure to be a hit. For something more Italian, you can make Aloo Cheese Croquettes or Pasta Cheese Balls. These are the best snacks to make when you have some leftover pasta or boiled potatoes. For something a bit more Indian, we have the Punjabi special Dahi ke Kebab. A thick batter of Hung curd, spices, onions and coriander is made. Here bread crumbs are also added to the mixture as well to make it a little thick and consistent. Mix bread crumbs with some idli rava to get super soft, fluffy instant Bread Idlis. The innovative recipe is a quick one in which we add curd as well to give that tinge of tanginess. Who says you can use bread crumbs to only make snacks? Hara Bhara Kebabs in Green Gravy is an example of that how when you have leftover bread or bread crumbs you can transform it into a creative subzi. You can even coat the Vegetable Burger patty in the bread crumbs to make it nice and crispy for crunchy exterior and soft interior. Italians love their bread, and their bread crumbs! Garlic Spaghetti Bake has a nice flavor of garlic coming through which is cooked in white sauce, and then topped with bread crumbs to give a crunchy layer. Eggplant and cheese taste fantastic together. When you add a coat of breadcrumbs on top, it makes the dish all the more better. Baked Cheesy Eggplant in Tomato Salsa brings all these wonderful flavors of cheese, eggplant and tomato together in a wonderful baked dish. The best desserts are the easiest ones. Why go through a complicated recipe when you can make a simple Chocolate Pudding with bread crumbs and chocolate in a pressure cooker! This recipe is quickly prepared in 30 minutes and satisfies the taste buds to the fullest extent. You can even bake a Christmas Dry Fruit Steamed Pudding to kick it up a notch. This has a lot of ingredients put together but is worth every ounce of effort! 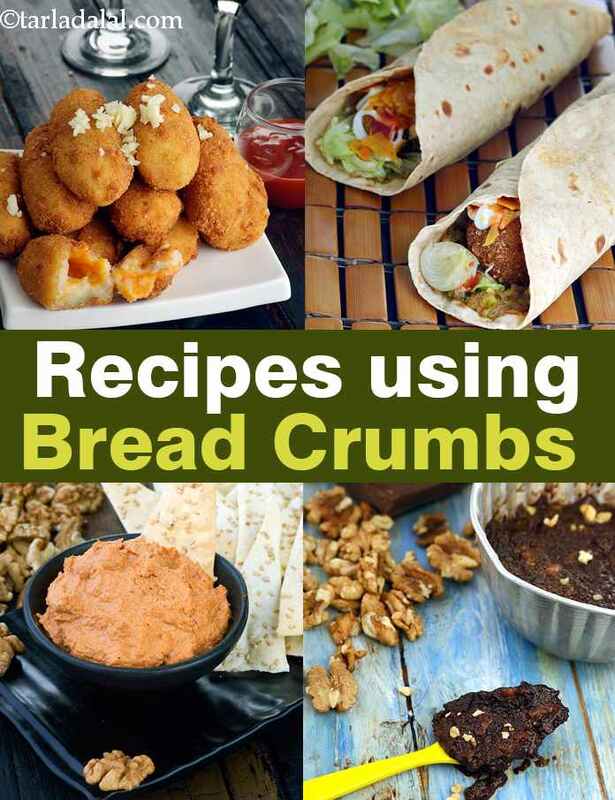 Enjoy our bread crumb recipes. Indian bread crumb recipe collection given below. A super alternative to french fries! crushed cornflakes lend a nice crunchy texture and appearance to the fingers. Since children usually enjoy potatoes, this is likely to be a big hit with them. Dip into tomato ketchup and enjoy this wonderful snack! A simple and subtle blend of ingredients shaped on a skewer and grilled to create seekh kebabs..... of a vegetarian kind. You can even shape them into tikkis and shallow fry if you like.